After we finished viewing the wild dogs we went to see a few male cheetahs. These are adolescents and important to note, not "ambassadors". There were fed behind the fence, but we were also able to see them inside the large fenced area. The animals have a lot of room to run and also trained in techniques that will allow them to survive when released into the wild. But release is selective as they are not released unless the area is safe for them to thrive - ie, not too many lions. Here are a few pictures of these beautiful creatures. One interesting feature is that each cheetah has a unique tear line. Sitting pretty and waiting for the jeep. 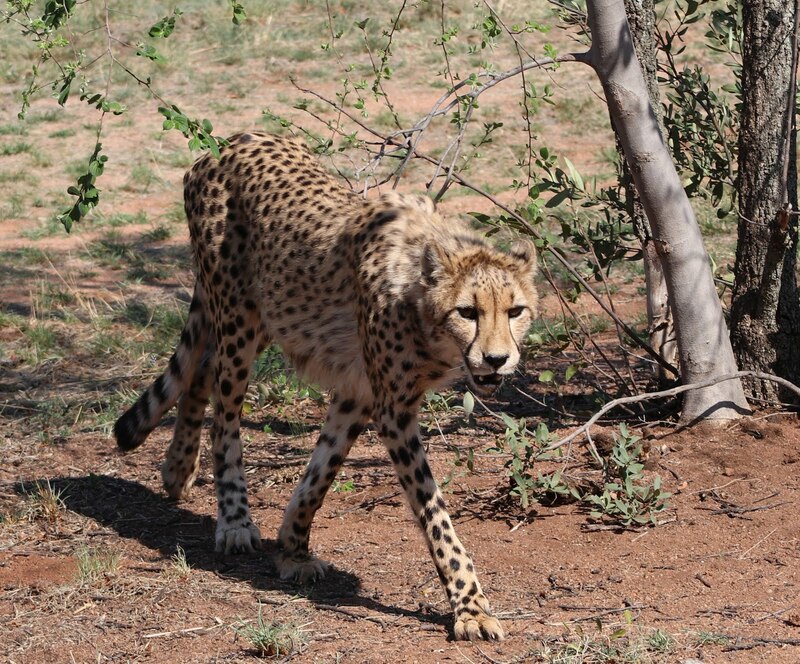 Here is our first cheetah of the day. Look at the gorgeous tail. Chow time! They were fed in an enclosure. Much more safe for the visitors. He was fun to watch. And quite handsome, too! Guinea fowl in the field. Feeding time. Workers go inside the enclosure to feed the cheetahs. An opportunity to pet the ambassador cheetah. He is a special cheetah used for education purposes. He was really patient. Baby cheetah on a poster. We did not see any little ones. 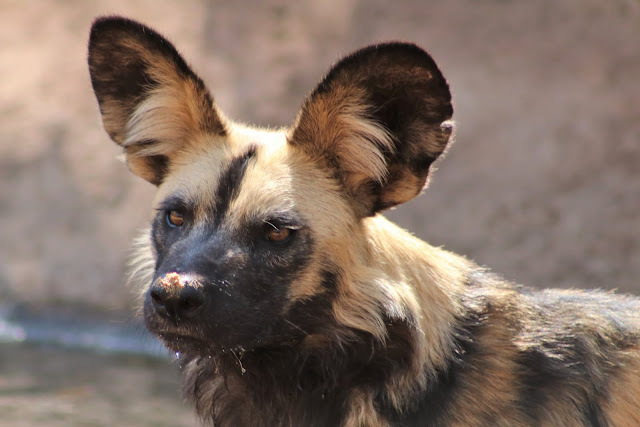 They also breed wild dogs and serve as a home for some injured birds. It was a great visit and I had the opportunity to pet a male cheetah. In a very careful environment, they have the ambassador cheetah (not all cheetahs are ambassadors) lie down on a table and one by one the visitors are allowed to pet his back. So cool. And he was so big! 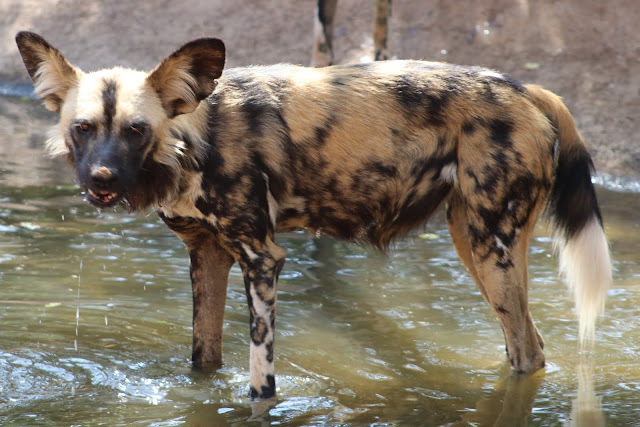 Even though the cheetahs are absolutely beautiful animals, I think my favorites on the farm were the wild dogs. We were able to watch them drink at a waterhole and there were fed by the workers. We were able to watch both the cheetahs and dogs feed - they are well aware that when the jeeps come by food is to follow. I really enjoy watching animal behavior and this was a very special event. Several vultures were at the Centre. They had been injured elsewhere and are brought here to love. Vehicle to take visitors to few the animals. Wild dogs. They have unique color patterns. Look at those teeth in some of the pictures.